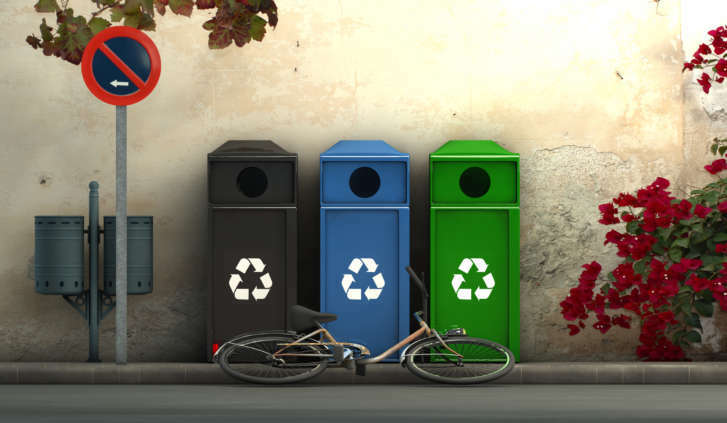 Around the world, people throw away about 4 million tons of trash each day — or roughly 2.6 pounds of trash per person. Here are some ways to cut down on waste and clean up the planet, one piece of garbage at a time. WASHINGTON — Here’s a stat that stinks: Around the world, people throw away about 4 million tons of trash each day — or roughly 2.6 pounds of trash per person. And in the U.S., the majority of that garbage goes straight to the country’s 2,000 landfills, where it can sit for years (450 years for a disposable diaper and 1 million years for a glass bottle). In her new book, “This Book Stinks: Gross Garbage, Rotten Rubbish and the Science of Trash,” Sarah Wassner Flynn breaks down the dirty details surrounding trash and the best ways to minimize it. Click through the gallery below for her tips on cleaning up the planet, one piece of garbage at a time. Sarah Wassner Flynn says the biggest and easiest way to reduce the amount of waste in the world is to recycle. Fifty years ago, few people knew about recycling. Now, it’s a common practice that many households, businesses and cities adapt. “Hopefully, every child [today] understands what recycling is,” Wassner Flynn said. Recycling bins are common in school cafeterias and fast-casual restaurants, and lessons on converting waste into reusable materials are part of many classrooms’ curricula. But Wassner Flynn wants to see recycling become an even bigger part of the daily routine — “like brushing your teeth or like flushing the toilet,” she said.